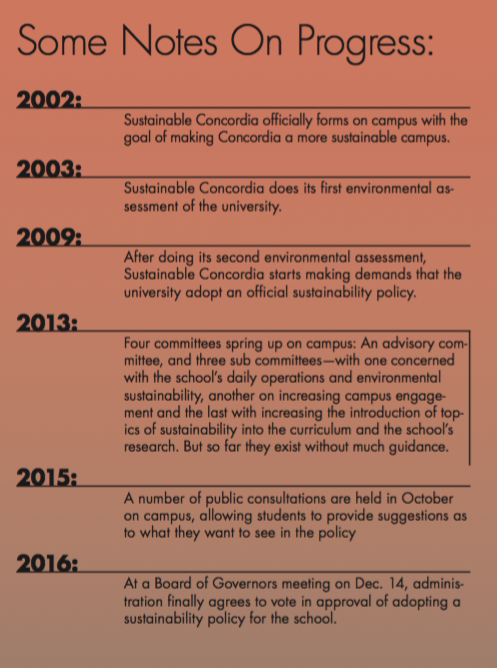 After eight years of pressure, Concordia is finally adopting a sustainability policy. Sustainable Concordia, an organization which promotes ecological, economic and social equality, has been pushing the university to do so since 2009—but it was only last month that the Concordia Board of Governors agreed to sign off on it at a meeting on Dec.14. The policy creates several guiding principles on topics like environmental protection, responsible production and consumption, ethical financial management, and the protection of cultural heritages. While the policy is meant to guide long-term action plans, so far none have been created. They will only come after public consultation with students, according to Concordia’s VP of Services Roger Coté. Those consultations will be organized by Sustainable Concordia in the upcoming months. He added that concrete action plans should be put in place by next summer or fall. For the last three years, there have been four committees working on campus with the goal of creating a more sustainable campus—but without a policy, they have been working without much guidance. The advisory committee, chaired by Coté, is the main decision-making body for sustainability projects at Concordia. A majority of its members come from the university’s administration. The advisory committee puts the final seal of approval on proposals presented to them by three sub-committees. One of the sub-committees is concerned with the school’s daily operations and environmental sustainability, another with campus engagement, and the last with increasing the introduction of topics of sustainability into the curriculum and the school’s research. The three sub-committees include a mix of faculty, administration, and students from Sustainable Concordia, the Graduate Student Association, the Concordia Student Union and the Sustainability Action Fund. Prior to the policy the university had the power to dissolve these committees at any time. Now, with the Board of Governors’ official approval of the sustainability policy, the committees are here to stay, Underwood said. Sustainable Concordia and the CSU are hoping the university will consider fossil fuel divestment as a result of this policy, according to CSU Sustainability Coordinator Lana Galbraith, and CSU General Coordinator Lucinda Marshall-Kiparissis. The policy promises that the school will only engage in financial management that is conducive to social and environmental well-being. “They should put their money where their mouth is,” said Galbraith. “It’s going to require stakeholders from the university community to make sure that the university is robustly and intimately making this policy an integral part of the university’s functions.” – Lucinda Marshall-Kiparissis, CSU General Coordinator. Concordia’s Endowment Fund, which deals with the university’s investments, currently has an investment of approximately $12 million to $15 million in fossil fuels, as made in a statement by its president Bram Freedman in 2013. Freedman also estimated that about ten per cent of Concordia’s investments were in fossil fuels. Freedman previously said that he doesn’t know exactly how much the university has invested in fossil fuels. This is because Concordia moved the endowment fund’s investments into third party pooled investment funds, which are not required to disclose their investment portfolios to the university. Freedman could not be reached by press time to comment on whether the university is considering fossil fuel divestment as a result of the new sustainability policy. “There will always be room for improvement,” admitted Coté. Marshall-Kiparissis said it’s important to remember that the push for this policy came primarily from students. She and Galbraith argue that part of the reason the university decided to adopt this policy is because they want to strengthen the school’s image as an eco-friendly campus. Beyond adopting this policy, they said the school has also looked to improve its reputation through its collaboration with the Association for the Advancement of Sustainability in Higher Education—under their Sustainability Tracking, Assessment, and Rating System—or STARS for short. This association provides ratings to post-secondary institutions based on their level of sustainability. STARS’s rating system operates based on sustainability performance information collected by colleges and universities internally. Marshall-Kiparissis and Galbraith want to remind students that it’s also their responsibility to hold the school accountable to the promises that are being made in the policy.